The Packers will bring back veteran tight ends Jimmy Graham and Marcedes Lewis in 2019, but that given that both players are over the age of 30, tight end must be a priority for Green Bay in next weekend’s draft, opines Jim Owczarski of PackersNews.com. Given that they own 10 picks and possess the fourth-most draft capital, the Packers will certainly have an opportunity to find a youthful tight end. With the 12th overall selection, Green Bay could theoretically target Iowa’s T.J. Hockenson, while fellow Hawkeye Noah Fant or Alabama’s Irv Smith Jr. could be in play with pick No. 30. The 2019 draft class is exceptionally deep at tight end, so the Packers should have plenty of chances to add to the position throughout the weekend. Speaking of the Packers‘ draft, Green Bay recently hosted Ole Miss offensive tackle Greg Little, according to Tom Silverstein of the Milwaukee Journal Sentinel (Twitter link). Not to be confused with the former Browns receiver of the same name, this Little is anything but at 6’6″, 325 pounds. Viewed as a potential Day 2 selection, Little could help reinforce a Packers offensive line that took a step back in 2018. While left tackle should be manned by David Bakhtiari for the foreseeable future, right tackle Bryan Bulaga is entering the final year of his contract. While other quarterbacks like Russell Wilson and Aaron Rodgers have recently campaign for new deals, Steelers quarterback Ben Roethlisberger has not taken the same tack, as Mike Florio of Pro Football Talk writes. Roethlisberger, 37, is entering the final year of his contract: he’s due a $12MM base salary and will count for $23.2MM on Pittsburgh’s salary cap. He’s still engaged in ongoing negotiations with the Steelers, and as Florio notes, Roethlisberger would be due more than $60MM over the next two years if the franchise tag was deployed, so that could be a starting point in talks. Free agent defensive end Geneo Grissom worked out for the Lions today, reports Howard Balzer (Twitter link). A former third-round pick of the Patriots, Grissom should be familiar with current Detroit head coach/former New England defensive coordinator Matt Patricia‘s scheme. Grissom, 26, never lived up to his draft billing and played in fewer than 200 defensive snaps for the Patriots before being cut last November. New Vikings backup quarterback Sean Mannion‘s one-year deal is a minimum salary benefit pact, tweets Ben Goessling of the Star Tribune. As such, Mannion will only carry the salary cap charge of a second-year player despite having four years of NFL experience under his belt. The former Rams signal-caller received a $90K signing bonus to become Kirk Cousins‘ understudy. The Vikings have agreed to sign backup quarterback Sean Mannion, according to Mike Garafolo of NFL.com (Twitter link). It’s a one-year deal for Mannion, tweets Ben Goessling of the Star Tribune, and it’s worth up to $900K, per Darren Wolfson of 1500 ESPN (Twitter link). Having lost 2018 backup Trevor Siemian to the Jets, Minnesota was searching for a signal-caller to play behind Kirk Cousins. Mannion met with the club last week, as did former Dolphins passer David Fales. A third-round pick of the Rams in the 2015 draft, Mannion has only attempted 53 passes during his four-year NFL career. His most significant action came in Week 17 of the 2017 campaign, when he started a meaningless game against the 49ers. In Mannion’s only pro start, he completed 20 of 34 passes for 134 yards. Mannion was replaced in Los Angeles by former Jaguars starter Blake Bortles, and hadn’t been linked to any other clubs in free agency. Despite his inexperience, Mannion is the favorite for No. 2 duties in Minnesota, although he could face competition for 2017 undrafted free agent Kyle Sloter. Cousins has proven extremely durable throughout his career, so Mannion may not get the opportunity to see much action for the Vikings. Since becoming a full-time starter in 2015, Cousins has started 64 consecutive games. After surprisingly getting canned by the Packers midseason, Mike McCarthy had remained conspicuously quiet. Until now. If you haven’t read it yet, you should check out Rob Demovsky of ESPN.com‘s recent interview with McCarthy. McCarthy finally dished on everything related to his firing, and expressed his displeasure with how it was handled. McCarthy was apparently blindsided by the decision to fire him midseason, and said it “couldn’t have been handled any worse” by Green Bay’s management. Notably published just one day before the explosive reports of dysfunction within the organization from Bleacher Report, McCarthy downplayed any tension between him and Aaron Rodgers. All McCarthy did to acknowledge a potential strain in their relationship was saying “to think you can be in a relationship that long and not have any frustrations, that’s unrealistic.” McCarthy also told Demovsky that he 100 percent plans to continue coaching in 2020. The longtime Packers coach was reportedly a candidate for the Jets and Browns openings, and it’s still unclear if he pulled himself out of the running or if he just wasn’t able to land a job. With Trevor Siemian bolting for the Jets, the Vikings are still trying to figure out their backup quarterback situation. They met with quarterback David Fales on Friday, per a team announcement. Fales spent last year as Miami’s number three quarterback behind Ryan Tannehill and Brock Osweiler. Minnesota also hosted former Rams backup Sean Mannion on a visit last week, but he left without a contract. Even though there was no agreement, Mannion is still “VERY much on the Vikings radar,” tweets Darren Wolfson of 5News Minneapolis. As of this writing, Kyle Sloter is the only other QB on the roster behind Kirk Cousins. When T.J. Lang opted to retire, he left a big hole on the right side of the Lions’ offensive line. But Detroit is apparently confident they’ll be able to replace him, according to recent comments head coach Matt Patricia made, via Tim Twentyman of the team’s official website. As Twentyman and Patricia broke down, the team has a number of options. They have Joe Dahl and Kenny Wiggins returning from last year, and they added Oday Aboushi this offseason. Patricia also said that second-year offensive tackle Tyrell Crosby could play some guard. Speaking of the Lions and holes, they had a massive one at tight end last year after Eric Ebron left. They got virtually nothing from the position last year, so it won’t be surprising if they draft one early in this year’s draft. To that end, the team hosted Alabama tight end Irv Smith Jr. for a visit on Thursday, according to a tweet from Josh Norris of Rotoworld. Smith Jr. is most analyst’s third-rated tight end, and could go as high as the first round. He caught 44 passes for 710 yards and seven touchdowns for the Crimson Tide last season. After seeing their 2018 backup sign with the Jets, the Vikings have a need behind Kirk Cousins. They will explore a replacement option this week. 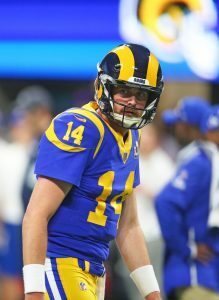 The Vikings are planning to meet with Sean Mannion at some point this week, Chris Tomasson of the St. Paul Pioneer Press reports. Mannion was viewed as a possible Trevor Siemian contingency plan. Siemian signed with the Jets last week. Mannion has only thrown 53 career passes, having backed up Jared Goff the past two seasons. Blake Bortles will now assume that position. A 26-year-old Oregon State product, Mannion spent four years with the Rams after arriving as a third-round pick in 2015. Mannion’s most significant audition came in Week 17 of the 2017 season, when Sean McVay rested his starters. His then-backup quarterback completed 20 of 34 passes for 169 yards. No other teams have been linked to Mannion thus far in free agency. While Minnesota wants to add a veteran to work as Cousins’ backup, Mike Zimmer did not rule out 2017 UDFA Kyle Sloter or a to-be-determined rookie filling that role, per Tomasson. Sloter, a Broncos UDFA the Vikings added on waivers in 2017, has yet to throw an NFL pass. Siemian also threw zero passes as a Viking. Cousins took all the snaps for the Vikings last season. Trevor Siemian will travel east to meet with the Jets about their backup job, according to Mike Garafolo of NFL.com (on Twitter). This meeting will occur Wednesday. The Vikings are interested in keeping Siemian as their backup, but the first-time free agent has a few teams interested, Garafolo adds. The Jets have been connected to Siemian for a while now. Siemian was on their radar a year ago, with the team connected to the then-Broncos quarterback via trade. New York had already re-signed Josh McCown and added Teddy Bridgewater, leading to Minnesota’s trade acquisition. In 2017, when some brief Tony Romo-to-Denver smoke surfaced, rumors of Jets-Siemian interested emerged. But Siemian returned as the Broncos’ 2017 starter. Now that Siemian’s a free agent and McCown is considering retirement, the Jets are exploring this addition for a third straight offseason. Siemian did not appear in a Vikings game last season; Kirk Cousins took every snap for Minnesota. Siemian, 27, fared better as the 2016 Broncos’ starter, with Peyton Manning‘s immediate successor leading the team to a 9-7 record and throwing 18 touchdown passes compared to 10 interceptions. In 2017, he rated as one of the NFL’s worst quarterbacks, prompting the Broncos to abandon their unusual experiment with the former seventh-round pick. Should Siemian defect to the Jets or sign with another team, the Vikings are interested in recent Rams backup Sean Mannion, Garafolo adds. The Rams just added Blake Bortles to be Jared Goff‘s backup. Mannion, who has thrown 53 career passes, is a free agent. After stepping down as Vikings offensive coordinator, Norv Turner is not looking for work at this moment. However, he is still interested in coaching, according to Adam Schefter and Chris Mortensen of ESPN.com. Once his Vikings contract runs out this winter, Turner would like the opportunity to help mold an up-and-coming quarterback. Turner says he’ll only return to the sidelines for the right opportunity or, as Schefter and Mortensen put it, “the right team in the right city with the right quarterback.” Given the Vikings’ offensive struggles under Turner, he is probably a stronger candidate as a quarterbacks coach than an offensive coordinator. Turner has had several stops as an OC in the NFL, but serving as strictly a QB coach at the professional level would be a first for him. The only time he ever held that title was with USC from 1981-1983. Christine Michael‘s release was about his regression as a runner and also a statement about the Seahawks‘ confidence in rookie C.J. Prosise, Mortensen writes. At Notre Dame, there were doubts about Prosise’s ability to grind out tough yards because of his soft-spoken personality. However, the Seahawks saw a warrior underneath his reserved demeanor and had enough faith to use a third-round pick on him. Going forward, Mortensen writes that Prosise is expected to be the main ball carrier with Thomas Rawls eased back into action. Case Keenum will move into a backup role behind No. 1 overall pick Jared Goff, but it’s actually possible that he’s bumped all the way down to No. 3 and made inactive on gamedays if the Rams fall out of the playoff hunt. Keenum is headed for free agency at the end of the year and L.A. will likely want to gauge what they have in Sean Mannion, a 2015 third-round choice. There has been a lot of talk about Oklahoma defensive tackle Charles Walker and his controversial decision to leave the team in advance of the 2017 NFL Draft. The popular view is that NFL teams will not look favorably upon Walker’s decision to abandon the Sooners, causing him to slide in the draft. However, Mortensen isn’t certain that clubs will concur with Oklahoma defensive coordinator Mike Stoops‘ framing of the situation. Walker suffered the third reported concussion of his career in early October and cutting his season short may benefit him on multiple levels. From a talent perspective, Walker is viewed as a first- or second-round pick for the spring. Before he threw a single regular-season pass for the Rams, Nick Foles signed a two-year extension that ensured he wouldn’t be eligible for free agency this winter. Although Foles is sticking around, he won’t be handed the starting quarterback job in 2016, according to Rams general manager Les Snead. Appearing on SiriusXM NFL Radio from the Senior Bowl, Snead told Mark Dominik and Alex Marvez that he expects Foles, Case Keenum, Sean Mannion, and any other offseason QB additions to battle for the No. 1 job this summer (link via Marvez at FOX Sports). “If I learned one thing last year, we should have let the quarterbacks have a competition from the start and the best man win instead of just passing the torch to Nick,” Snead said. The Rams are paying Foles like the starter, as the former Eagles will count for $8.75MM against the cap in ’16. By comparison, Mannion will have a cap hit under $1MM, while Keenum – a restricted free agent – likely won’t make more than $2-3MM. Still, it sounds like Foles’ higher price tag won’t guarantee him anything. 49ers wideout Anquan Boldin, who is eligible for free agency this winter, spoke briefly to Chip Kelly after the new head coach joined the team, but said today that he has yet to engage in negotiations with anyone from the Niners’ front office about a new contract. Eric Branch of the San Francisco Chronicle has the details, along with Boldin’s quotes. Former Missouri edge defender Michael Sam plans to take “one more shot” at making an NFL roster this year, he tweeted on Tuesday. Sam became the first openly gay player to be drafted when he was selected by the Rams in 2014. After bringing him in for a workout last month, the Cardinals have tried out defensive back Joel Wilkinson again, tweets Aaron Wilson of the Houston Chronicle. Earlier today, veteran Cardinals long snapper Mike Leach announced his retirement. Our full story can be found right here. Titans wide receiver Justin Hunter‘s case was continued until Sept. 15 because a defense witness did not show up to court today, Terry McCormick of TitanInsider.com tweets. Just days ago, Hunter had his charge reduced to a misdemeanor. The 24-year-old was viewed as a potential breakout candidate last year, but battled injuries and complied just 498 yards and three touchdowns on 28 receptions. Here’s more from around the NFL..
Judge Richard Berman will issue his decision and order in the Tom Brady case by the end of the week, as Adam Schefter of ESPN.com tweets. As it stands, the Patriots QB is set to serve a four-game suspension. Following his doctor’s visit, Jaguars tight end Julius Thomas has decided to have surgery on his injured finger on Wednesday, a source told Ian Rapoport of NFL.com (on Twitter). Thomas could be out for a month, as previously estimated. Larry Foote was coaching at Cardinals practice today, which is likely a sign that he’s not playing this season, Josh Weinfuss of ESPN.com tweets. Foote had to make a decision on his status by 1pm Arizona time, and that deadline has come and gone. The Cardinals added the 35-year-old to their coaching staff earlier in the offseason with the intent of signing him to the roster later in the summer if he decided to continue playing. Rams coach Jeff Fisher made it clear that Case Keenum will be the team’s No. 2 quarterback, Nick Wagoner of ESPN.com tweets. That leaves Austin Davis and Sean Mannion to battle for the No. 3 job (link). Given that Mannion was a third-round pick this year, it seems unlikely that Davis will win that battle. As expected, the Rams have signed their entire 2015 draft class in one fell swoop, according to Jim Thomas of the St. Louis Post-Dispatch, who tweets that first-round running back Todd Gurley and seven other draftees have inked their rookie contracts with the club. Gurley’s four-year deal will, of course, be the most lucrative of the bunch, with a signing bonus worth about $8.313MM and an overall value of $13.823MM, per Over The Cap. The contract for the 10th overall pick will also be the only one that features a fifth-year option, allowing the Rams to lock up the running back for the 2019 season. While most teams announce their signings in bunches in the weeks following the draft, the Rams make a habit of waiting until mid-June to confirm their rookie deals. Head coach Jeff Fisher has said in previous years that he likes to make sure his newcomers are educated on financial planning before they sign their first NFL contracts. Broncos owner Pat Bowlen‘s son John Bowlen Jr. was released on a $1,000 bond after being arrested on suspicion of third-degree assault and harassment stemming from a domestic violence incident Wednesday night, reports Nicki Jhabvala of the Denver Post. Bowlen Jr. allegedly pushed his girlfriend against a wall as she was trying to call the police as a result of his “erratic behavior,” per Jhabvala. She told police he was under the influence of nitrous oxide and alcohol. “This is the owner of the Denver Broncos. I am sorry. Nothing is wrong,” Bowlen Jr., 29, said when he picked up the phone, according to the police report. The Broncos placed him on an indefinite leave of absence. Bowlen Jr. works as an administrative employee with the team but is a candidate to take over when Pat Bowlen, 71 and stricken with Alzheimer’s, decides to cede ownership to one of his seven children. Per Jhabvala, Bowlen Jr. had drug charges dismissed and was arrested under suspicion of alcohol-induced driving in 2003 and 2005, respectively. Here are some (lighter) notes from the Western divisions. The Rams may have adjusted contracts with seasonal contractors to coincide with the NFL’s February 2016 deadline for relocation bid submissions, reports Brian Feldt of the St. Louis Business Journal. According to Feldt, these contracts typically run from May to May, but with owner Stan Kroenke securing land in Inglewood, Calif., for a possible $2 billion stadium, he likely plans on posting a bid between Jan. 1 and Feb. 15, 2016. Two Rams contractors told Feldt their contracts were changed, with the Rams saying telling one it’s to coincide with the end of the season. The NFL will hold a special owners meeting Aug. 11 in Chicago on the topic of the three-team Los Angeles relocation derby, according to Daniel Kaplan of the Sports Business Journal (via Bernie Miklasz of the St. Louis Post-Dispatch). Miklasz notes this date is important for St. Louis in its effort to securing a site and funding for a new stadium on the north Mississippi riverfront. The Post-Dispatch columnist also notes the NFL is expected to let teams apply for relocation starting this fall. League executive Eric Grubman, who’s serving as the NFL’s point man on the Los Angeles efforts, told reporters the special meeting will determine if the NFL needs to provide an “expedited timetable” for teams looking to move, meaning the Feb. 16 deadline could indeed be moved up, according to Eric D. Williams of ESPN.com. For San Diego’s prospects, Williams reports Chargers and NFL officials think the $1.1 billion proposal put forth by a local advisory group for a stadium in Mission Valley, Calif., is “nowhere near enough” to bring about an actionable plan to keep the Chargers in the city they’ve played in since 1961. The Rams appear to have more zone-blocking concepts in store this season under new offensive coordinator Frank Cignetti Jr., reports Nick Wagoner of ESPN.com. And though Todd Gurley remains a ways away from full practices, the rookie runner worked on some straight-line speed with Rams trainer Byron Cunningham and caught passes from rookie quarterback Sean Mannion, although those weren’t at full speed. After working at EXOS training facility in Phoenix from January to April, Colin Kaepernick appears to have a quicker release, according to Matt Barrows of the Sacramento Bee. Entering his third full season as the 49ers QB, Kaepernick is expected to return to the facility to finish up his offseason work in July. Albert Wilson joined Dontari Poe in leaving early from Chiefs OTA practice, exiting Thursday’s workout due to a hamstring injury. Poe departed Wednesday’s workout with a back ailment, reports Terez A. Paylor of the Kansas City Star. Speaking at a town hall meeting with fans, Pete Carroll noted this team’s depth may be the best it’s been in his tenure. Of course, town hall addresses aren’t exactly hard-hitting reports, but offensive line coach Tom Cable said the competition to replace Max Unger could soon be down to two or three players, according to the Seattle Times’ Bob Condotta. Lemuel Jeanpierre is leading that competition — or at least receiving the first opportunity to do so by trotting out with the starters in OTAs. Giants Targeting Late First-Round QB? Chargers Out On Josh Rosen? Mississippi State’s Montez Sweat Misdiagnosed? Darnell Savage To Be First-Round Pick?